Authentic Thai Stir Fry Chili Duck Recipe (ผัดเผ็ดนกเป็ดน้ำ) - Insanely Spicy! Thai Stir Fry Chili Duck Recipe (ผัดเผ็ดนกเป็ดน้ำ) – One of the Spiciest Thai Dishes! In this Thai recipe, you’ll learn exactly how to make Thai spicy chili stir fry (ผัดเผ็ด). This is one of the Thai recipes my mouther in-law loves to cook (and I love to eat), so I’m excited to share this recipe with you today. 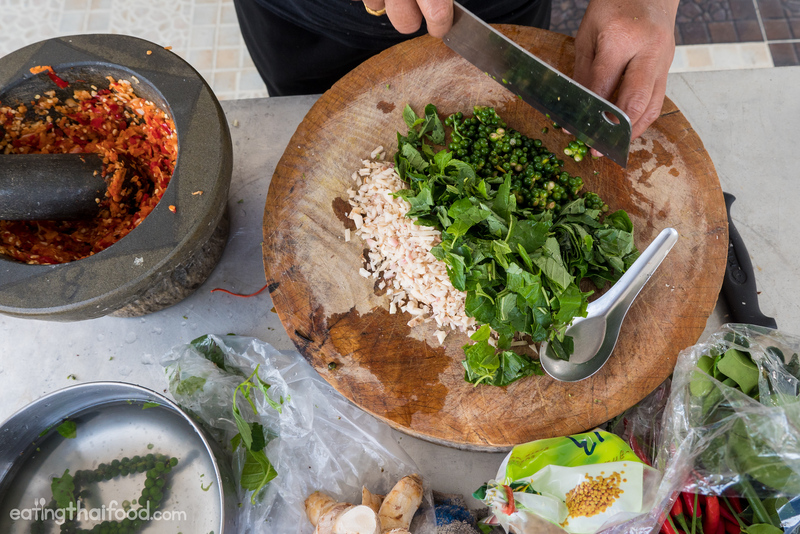 You’re about to make an authentic Thai dish that’s condensed with so much flavor, it will literally take your taste buds to new levels! NOTE: While I used wild duck for this recipe, you can easily substitute any kind of meat you like — minced beef or minced chicken — would both taste amazing. What is pad ped (ผัดเผ็ด)? There’s a Thai dish known as pad ped (ผัดเผ็ด also spelled pad phet), which literally translates to stir fried (pad) spicy (ped). 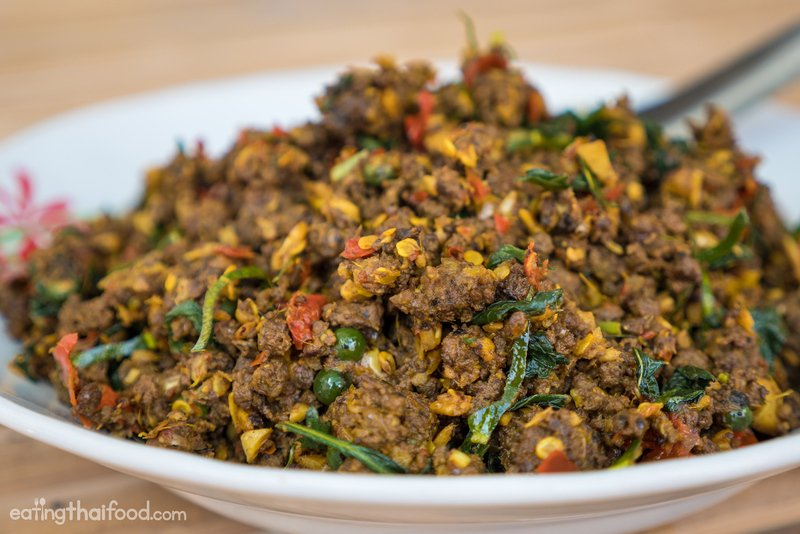 Typically it always includes curry paste, stir fried with some kind of meat, and often some extra fresh chilies tossed in for good measure. You can guarantee pad ped (ผัดเผ็ด) is a dish for spicy food lovers — but don’t worry, you can still make this dish on the less spicy side if you prefer, and the flavor will still be spectacular. For this recipe, my mother in-law used wild water duck, which in Thai is called nok bet nam (นกเป็ดน้ำ), but feel free to use whatever minced meat you like. 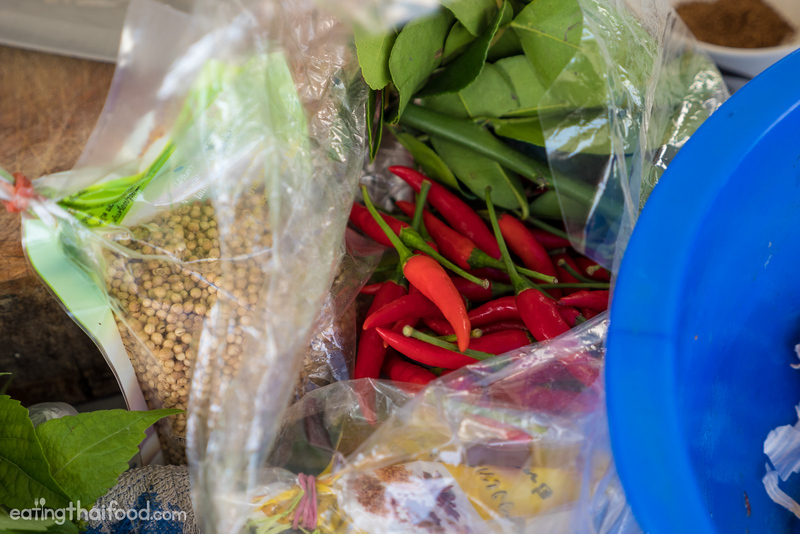 Making this spicy chili stir fry with wild water ducks is especially a common dish in the Southern Thai province of Songkhla, my mother in-law explained to me. 500 grams (1.10 lb.) 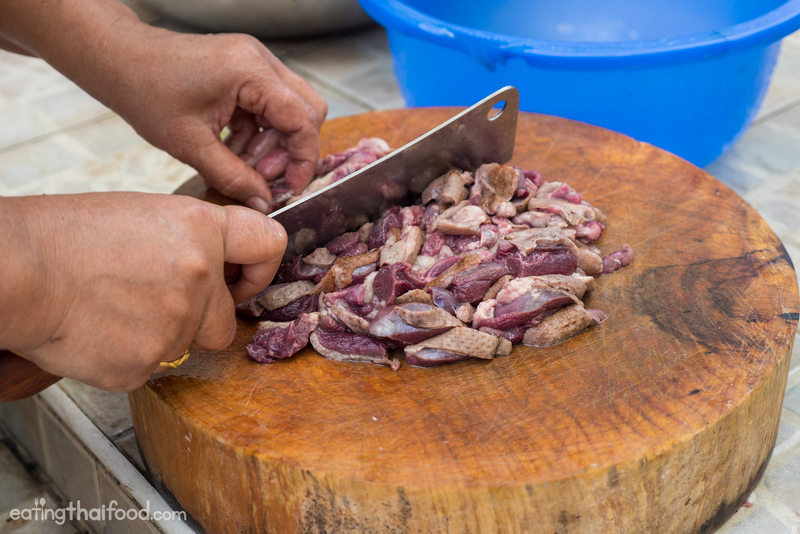 of minced meat (นกเป็ดน้ำ) – I used 2 small wild ducks, which weighed in at 800 grams before gutting and taking out some of the bones (so the minced meat was about 500 grams in total). You can use duck or beef or chicken — pretty much any minced meat would work well with this recipe. 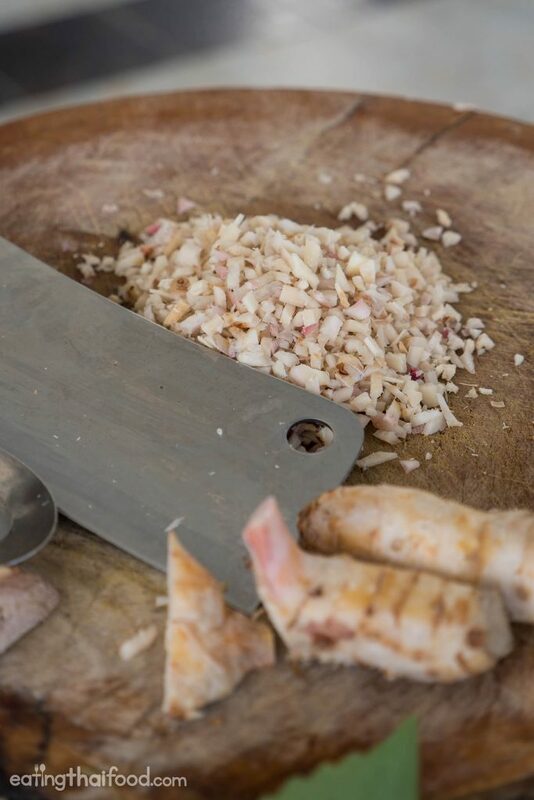 2 – 3 thumb sized chunks of young galangal (ข่าอ่อน) – when chopped up it equalled about 6 tbsp. 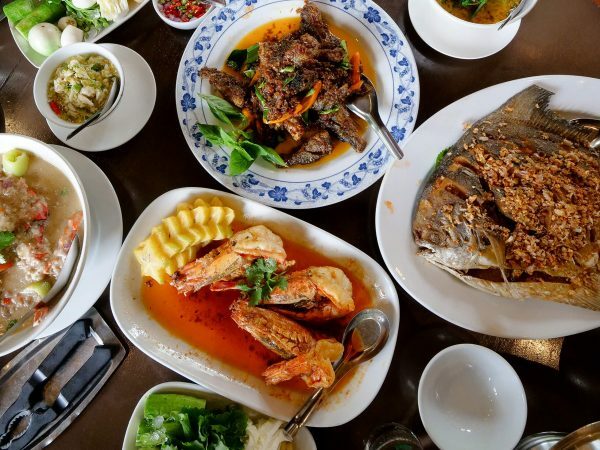 fish sauce to taste if needed (น้ำปลา) – when my mother in-law cooked this recipe she didn’t add any extra fish sauce because there was already enough saltiness from the curry paste, but you’ll have to taste test to see. For concise step by step directions to this recipe you can scroll down to the recipe box at the bottom of this post. But keep reading below for a more in depth explanation and instructions about all the ingredients and steps. 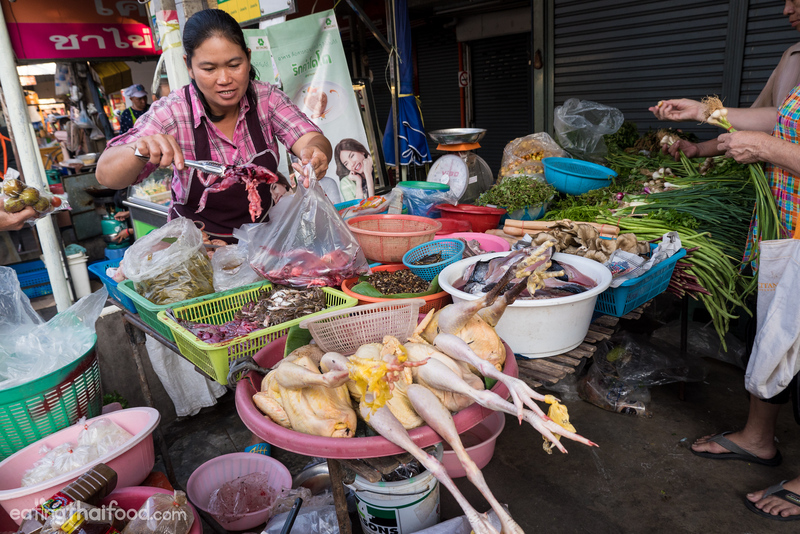 My mother in-law and I went to the market in Bangkok one day and they happen to have wild water ducks (นกเป็ดน้ำ) at the jungle ingredients stalls. The wild ducks come from the market all in tact, only the feathers have mostly been removed. 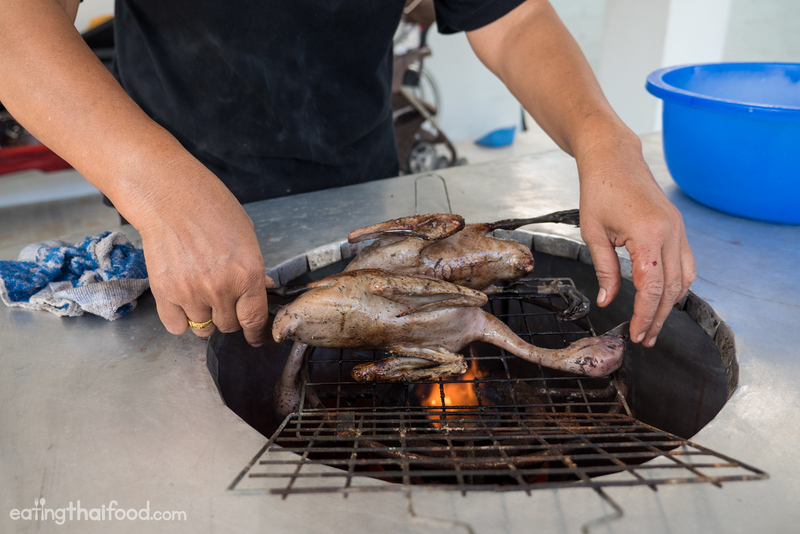 So if you make this Thai recipe with a whole duck or chicken, the first step is to prep the meat. 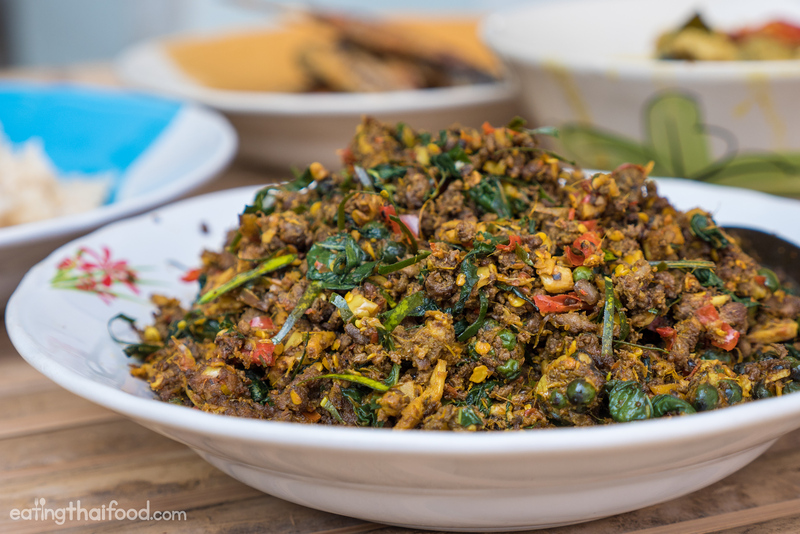 NOTE: If you’re making this Thai chili stir fry recipe with already minced chicken or minced beef, you can skip these first few steps of preparing the wild duck. In order to remove the feather stubs, you first need to scorch the skin. My mother in-law roasted the ducks for a few seconds directly over the fire burner. It just takes a few seconds, just to singe off the feather stubs. You then cut the meat off the bones of the wild duck. Some of the smaller bones, like the rib cage, are small enough to be edible, and you can chop them up with the minced meat. 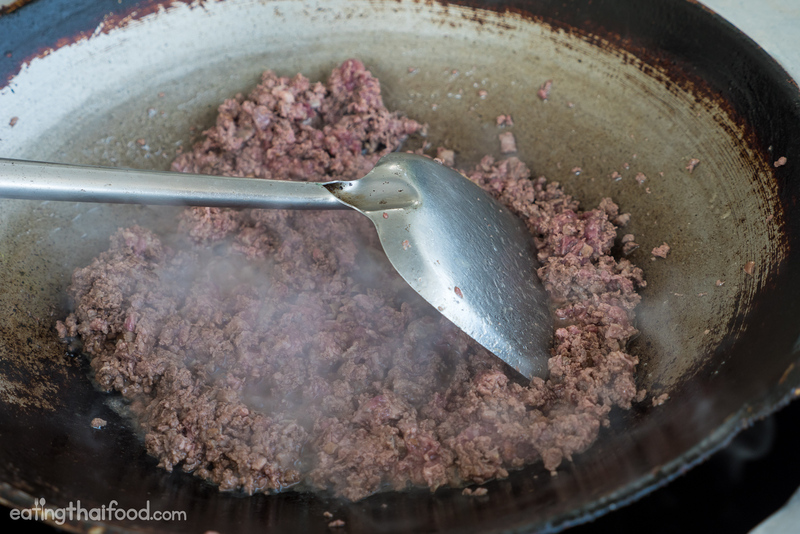 Mincing meat by hand is actually a lot faster and easier than it looks. 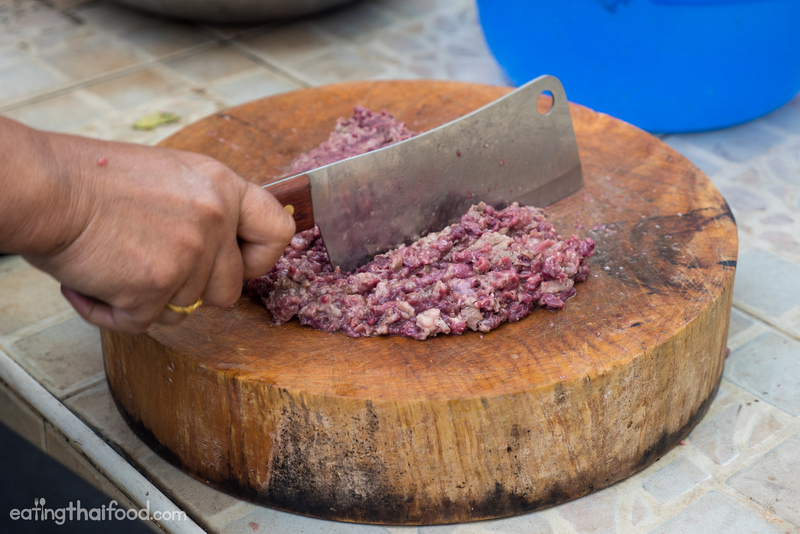 Using a cleaver, I use a Thai Kiwi cleaver, you just keep chopping and chopping, and in about 5 minutes or so, you’ll have a wonderful fresh mince. 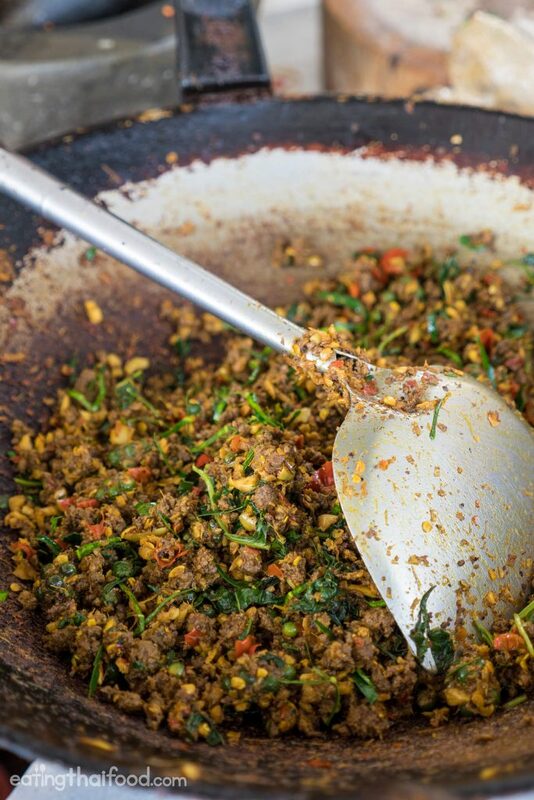 You’re looking for a medium minced meat grind for this Thai recipe. Once your minced meat is prepped, it’s time to dry stir fry it. We’ll be preparing all the ingredients separately, and finally assembling everything together. Stir fry the minced meat on medium heat with no oil until fully cooked. Then drain out the oil — you only want the dry cooked minced meat. Next, it’s time to prepare your spices and herbs. 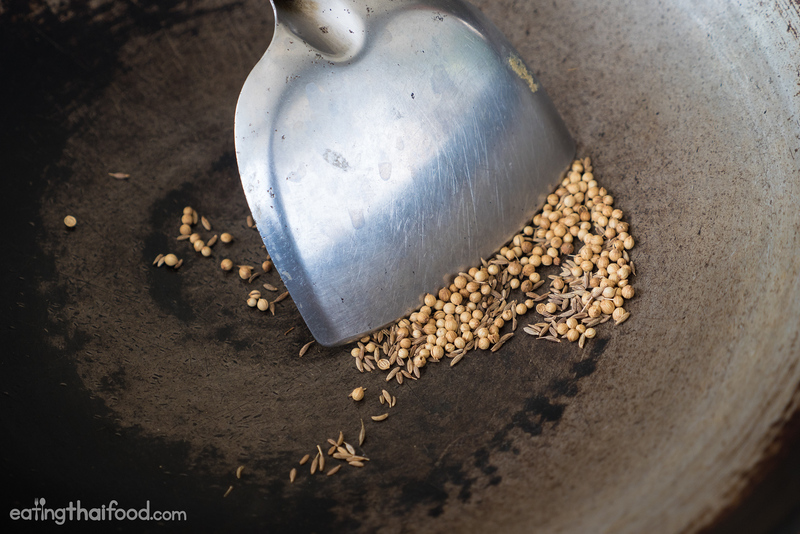 If you’re using powder cumin and coriander you can skip this step. But for the most fragrant spice flavor, you should use whole cumin seeds and coriander seeds. Dry roast them together in a medium hot pan or wok for about 30 seconds or so, then pound them into a powder using a mortar and pestle or a food processor. For this Thai stir fry chili recipe, my mother in-law used 20 fresh Thai birds eye chilies and an entire head of garlic. The chilies are just for extra supplemental spiciness, but keep in mind there will also be a lot of heat mainly coming from the curry paste that we’ll be using in this recipe as well. 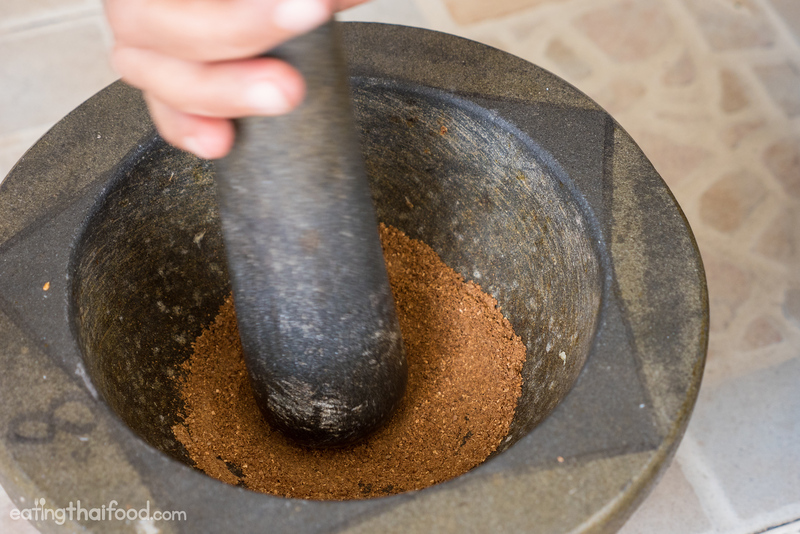 Pound the chilies and garlic in a mortar and pestle until you’ve got a coarse grind. And again, set it aside for later use. Oftentimes galangal is used in Thai cooking to boil and release its flavor like in tom yum soup, and the galangal is not actually eaten. But when you have young galangal, it provides some amazing flavor and because it’s not too tough, you can eat it all. If you can find young galangal when you make this recipe, use 2 – 3 thumb sized chunks, and mince it. Tree basil (ocimum gratissimum), which in Thai is called bai yeera (ใบยี่หร่า) is an amazing herb. It has an almost clove flavor to it, while being sweet and peppery at the same time. For this Thai duck recipe (ผัดเผ็ดนกเป็ดน้ำ) if you can find tree basil, that would be awesome, but you can alternatively use any kind of basil or strong peppery tasting herb for this recipe. Pluck the basil leaves off the stem, give them a coarse run through with a knife, and set them aside. For the green peppercorns, which are optional for this recipe, but a welcome spicy addition if you can find some, just coarsely chop them as well. 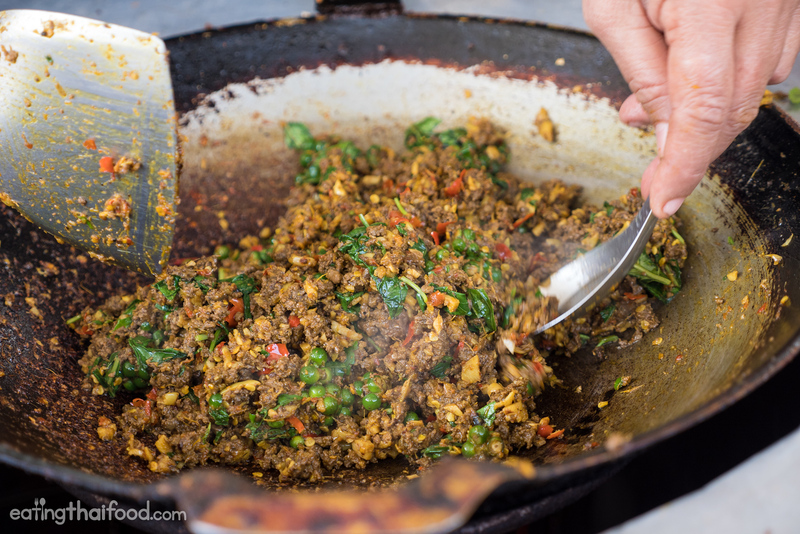 One of the main ingredients for any Thai pad ped recipe (ผัดเผ็ด) is curry paste. Curry paste of some kind is always used for flavoring and to provide a huge amount of spice. For this recipe, my mother in-law used southern Thai curry paste, which we already had in the freezer. You can use southern Thai curry paste for this recipe, or you could alternatively use Thai red curry paste. If you have the time to make your own fresh curry paste using the recipes above, that would give you the best taste, but you can also use yellow curry paste in a tub or canned red curry paste in a can or tub if you need to. You have all your ingredients ready; It’s time to stir fry everything together. If you haven’t already watched the video above, this is where the video will be really helpful. Turn your wok or pan to a medium heat and add in about 2 tbsp. of oil. Let it heat up before adding in the pounded chilies and garlic. Stir fry for about 30 seconds and then add in the curry paste. Stir fry for about 2 more minutes, and if it gets dry you can add in just a little splash of water to help things along. Next goes in all the pre-cooked minced meat, minced wild duck in this case. Keep stir frying and mixing constantly on a medium high heat for about 3 minutes. You want most of the moisture to evaporate. Then toss in the galangal, and cumin and coriander, and stir fry for another 1 minute. Next add in the chopped tree basil and green peppercorns, and keep stir frying, folding them into the meat. At this stage you can taste test your Thai chili stir fry. It should be spicy and salty. When I taste tested it was salty enough from the curry paste. But if you need more saltiness, add in some fish sauce. Final step is to take about 15 kaffir lime leaves, stack them on top of each other, and shave them finely. Sprinkle all the kaffir lime leaves on top and fold them into the stir fry for about 30 seconds, and turn off your heat. Just look at all that flavor!! When you’re finished cooking, dish it onto a plate, and make sure you eat with hot fresh white or brown rice. 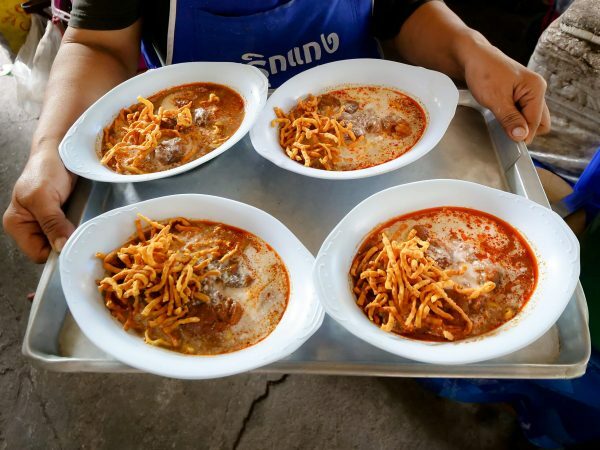 I like to say that this dish, and especially the way my mother in-law makes it, it has to be one of the most flavorful dishes in Thai cuisine per square millimeter. It’s going to be spicy, and crazy delicious! There's a stir fry dish in Thailand known as pad ped (ผัดเผ็ด), which means stir fried with chili and always spicy. In this recipe you'll learn how to make minced duck, stir fried with chilies and herbs, and curry paste (ผัดเผ็ดนกเป็ดน้ำ). 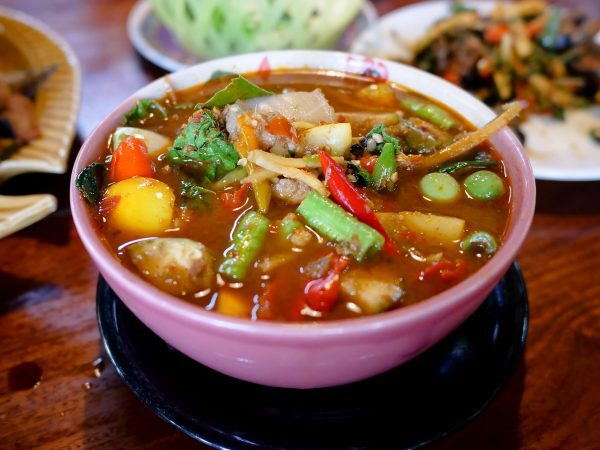 It's one of the most flavor packed Thai dishes you might ever try! 2 - 3 thumb sized chunks of young galangal (ข่าอ่อน) - after being chopped you should have about 6 tbsp. fish sauce to taste if needed (น้ำปลา) - there's salt in the curry paste, so you may or may not need fish sauce, you need to taste test. First prepare your minced meat. If you're using already minced chicken or beef, skip to the next step. For wild duck, singe the feather stubs over a flame, fully wash the duck, then debone the meat. Using a cleaver, chop the duck on a cutting board until coarsely minced. 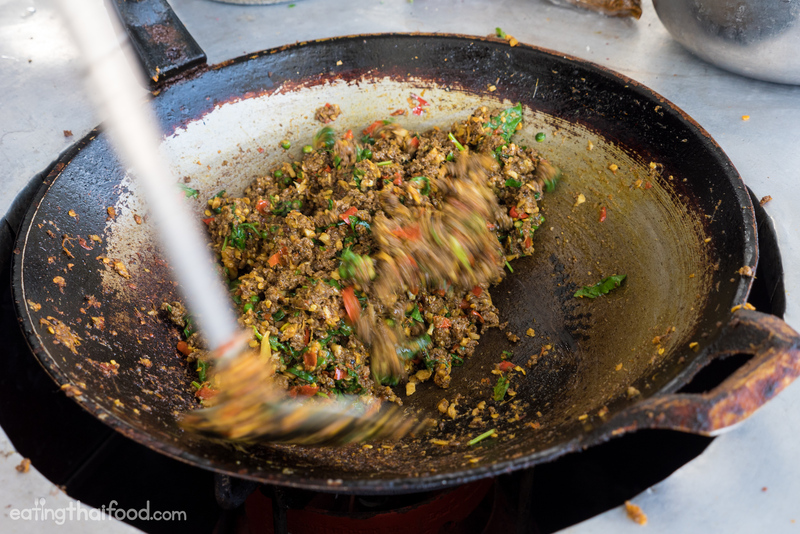 Stir fry the minced meat in a wok or frying pan, using no oil, until fully cooked. Drain and set aside for later. If you plan of making curry paste yourself, make the curry paste at this time. Or you can use curry paste from a can or tub. Dry stir fry the cumin and coriander seeds for about 30 seconds to make them fragrant, then pound them in a mortar and pestle until you've got a powder. Again set aside for later. 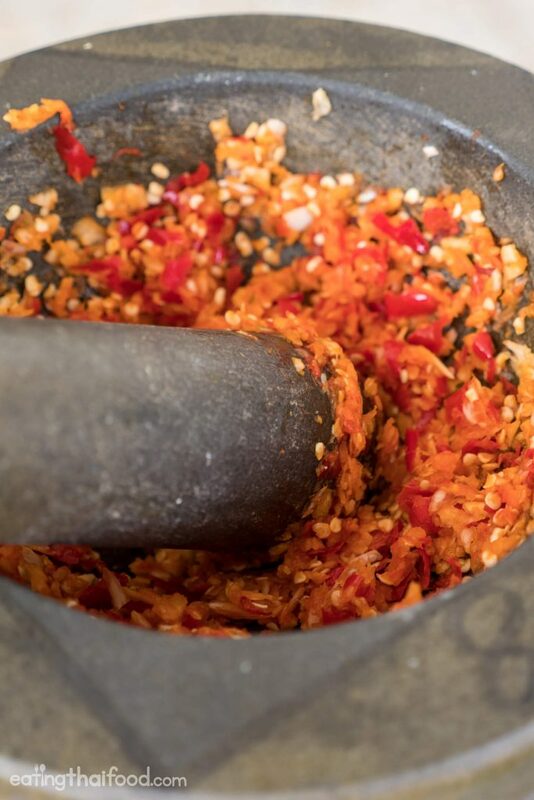 Pound the Thai chilies and garlic in a mortar and pestle. 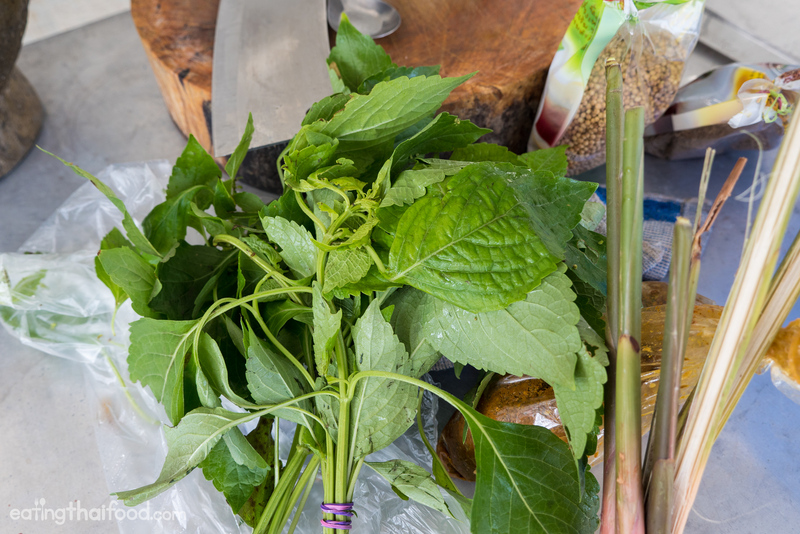 Mince the young galangal, pluck the tree basil leaves off the stem and give them a coarse chop. For the green peppercorns, give them a quick chop with your knife. When your ingredients are prepped, it's time to stir fry them together. Heat your wok or frying pan to a medium high heat and add about 2 tbsp. of oil. When the oil is hot, add the chilies and garlic, and stir fry for 30 seconds. Then add in the curry paste, and keep stir frying for about 2 minutes. If it gets too dry add a splash of water. Add in the minced wild duck and keep stir frying for about 3 minutes. Toss in the galangal and powder cumin and coriander, and keep stir frying for a couple more minutes. At this point you can taste test for saltiness. You can add some fish sauce if you need extra saltiness. 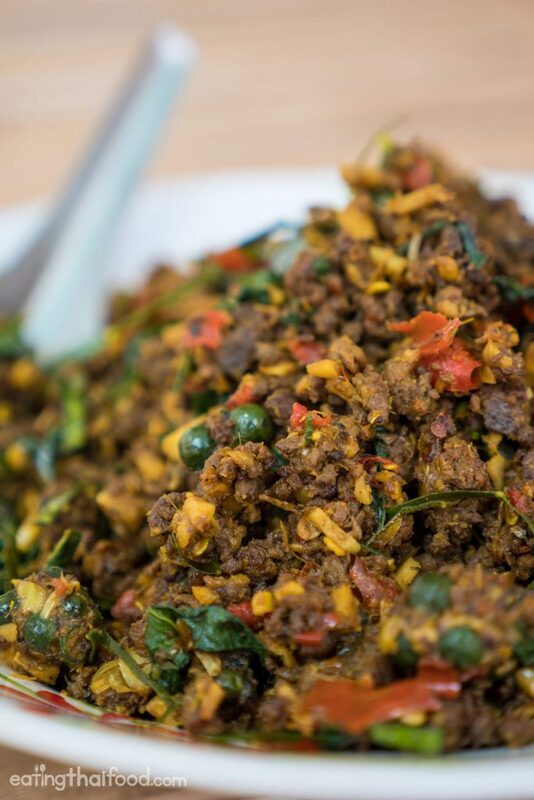 Next, add the chopped tree basil and green peppercorns, and fold them into the mince meat. The final step is to grab about 15 kaffir lime leaves, stack them on top of each other, shave them into thin strips, and sprinkle them into the dish. Stir fry for a few more seconds and turn off the heat. In this Thai chili wild duck recipe (ผัดเผ็ดนกเป็ดน้ำ) you'll learn to make a Thai dish that's packed so full of flavor, it will elevate your taste buds to new levels! I used minced wild duck in this recipe, but feel free to make it with minced chicken or minced beef, or even minced lamb would work well. Enjoy with hot freshly steamed white or brown rice. There’s no doubt that Thai style pad ped (ผัดเผ็ด), or chili spicy stir fry, is one of the most flavor packed dishes in all of Thai cuisine. It’s a dish I LOVE to eat, and that’s why I’m so excited to share this authentic Thai recipe from my mother in-law with you. If you love to eat spicy food, make this Thai recipe, and I can just about guarantee your taste buds will rejoice! Check out more authentic Thai recipes here. Let me know what you think in the comments section below. I’d love to hear from you! 49 comments. I'd love to hear from you! Thanks Mark for sharing your mother in Law’s recipe. I just made it on the weekend using beef mince. Must say, it packs a punch!! I couldn’t stop eating it. I sneakily added some Thai apple eggplant to the stir fry and had it with a crispy fried egg on top. Looks yummy. Thank you for this great recipe! Cooked it tonight and it is simply excellent. I also my favorite Japanese food. I think Koi restaurant Bangkok is the best Japanese food restaurant in Bangkok. 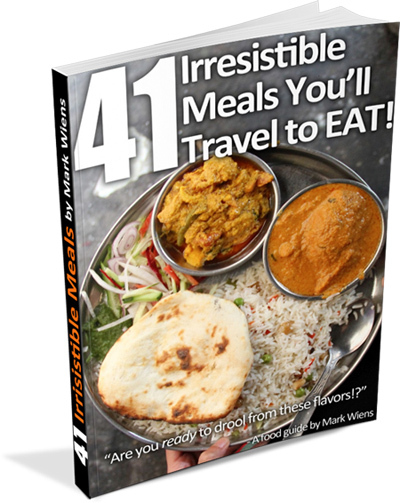 I’m a big fan of you mark here in Philippine I love eating and cooking, I follow all you’re video, hope to see you someday,.. Godbless you’re travel always,..
how about a recipe for the COCONUT MILK BBQ CHICKEN ?? made your mother-in-law’s GREEN CURRY last night (with frog legs) and it was fabulous !!!! when you gonna make another batch of TOM YUM t-shirts ??? I had pad ped moo at my girlfriend’s home in Southern Thailand, made by her sister-in-law, and also at her grandmother’s home, made by grandma. Sooooo good! Probably one of the best things I ate while visiting, and I was treated to awesome food everyday. Thanks for the site, I love it. Hi Mark, were can I buy wild duck? Nearest place I know is Nakhon Nayok….. This looks great! You mention that it’s OK to make this with southern curry paste or red curry paste, but about green? Is that strange? Hey Mark thanks for the recipe! But it looks quite close to a khua kling, isnt it? (I tend to add galangal in my klua kling). Cheers! Hey Jeff, yes definitely similar to Khua Kling. Thanks! Dude! Phenomenal! Made and eating it right now. Perfect with a cold beer. So good! Looks lovely. My wife is Thai and she makes amazing food. 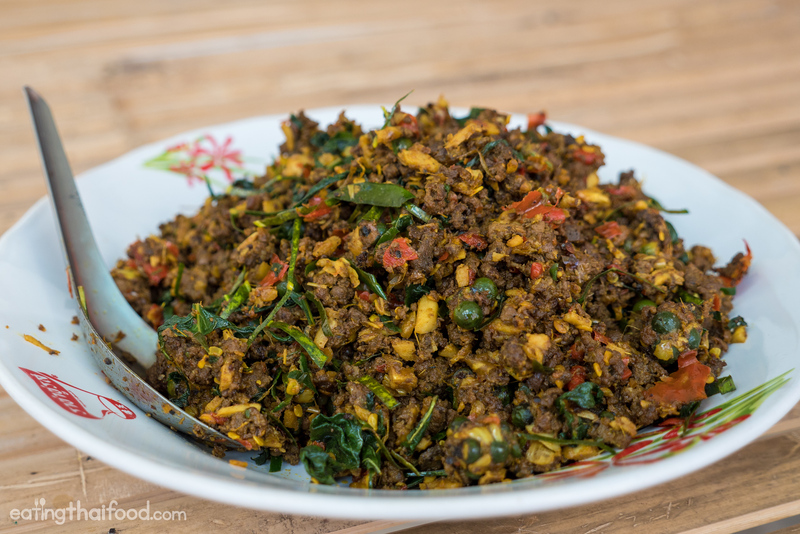 One of my favourite dishes that she makes is a stir fried duck dish – aroi mak mak! Looks yummy Mark. I’m definitely gonna try it as soon as lent is over. Wow great and fantastic receipe, I will cook with duck but i will cooking with chicken also coz my wife dont like duck. Thank u very much for all Mark. Hey Didier, sounds good, this recipe would go well with chicken. Awesome to hear that Jayantha, glad it turned out so well! Hi Mark, your MIL’s recipe is certainly worth a try. Thanks for sharing it. Will use tempeh instead of the duck as I don’t eat meat. Hey Angela, that’s a great idea, wow with tempeh that’s going to taste delicious! Salivatingly Delicious as always . Thanks You Thai Food Guru. Thank you very much Brendan! That looks like it is so delicious. Thank you and your mother-in-law for sharing this recipe with us. I am a long time fan and I appreciate every video you Ying produce. Awesome job! Thank you Irene, you could substitute chicken or beef for this recipe as well. Mark – A most excellent video. Any opinion on the importance of young galangal vs. mature root? Will you get 90% of the flavor with well minced mature galangal and either thai or ordinary basil? I find your work very inspiring! Hey Jay, thank you very much. Most of the reason for the young galangal is because it won’t be so chewy, but old galangal would work as well, I think if you minced it a little finer. Also, any kind of pepper herb / basil should work well with this recipe. Hey Mark, big fan of yours and been following you since a year. Nice recipe and oh boy such great detailing in writing the recipe, great job! BTW, i am from Delhi (India), do let me know when you come again any time, will suggest you many treasures. Keep Eating …. Hey Pushkar, great to hear from you, thank you very much for your support. Wow, excellent, I would love to visit Delhi again! Hey Mark. you are such a lucky dude have the best mother in law who cooks so good for you. I would love to meet her one day when I visit Thailand. I love that dish. She is the best. Thank you so much for fantastic video. Thank you very much Nui, that would be great! Hi Mark . I cook quite a lot thaifood from time to time … i think you have a really nice nd easy to understand way to present it …,good luck with the coming recepies . Hey Anders, glad you enjoyed cooking Thai food, thank you very much! Wow, what a wonderful recipe. Must try it sometime. Great pics as always , Love this site. keep it coming. Thank you very much Vinod, hope you can try it out.